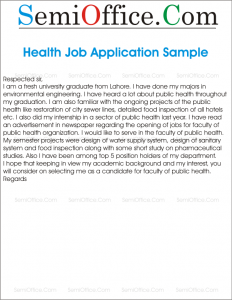 Sample job application for public health jobs in private or govt sector by university graduates to send resumes. I am a fresh university graduate from Lahore. I have done my majors in environmental engineering. I have heard a lot about public health throughout my graduation. I am also familiar with the ongoing projects of the public health like restoration of city sewer lines, detailed food inspection of all hotels etc. I also did my internship in a sector of public health last year. I have read an advertisement in newspaper regarding the opening of jobs for faculty of public health organization. I would like to serve in the faculty of public health. My semester projects were design of water supply system, design of sanitary system and food inspection along with some short study on pharmaceutical studies. Also I have been among top 5 position holders of my department. I hope that keeping in view my academic background and my interest, you will consider on selecting me as a candidate for faculty of public health. I saw this opportunity in the XYZ newspaper on Wednesday September 12, 2018. I have recently completed my BS in Public Health from the University of AAA. My GPA has always been above 3.2 for each semester with the CGPA of 3.58. My education and final year project makes me a best fit for this job. Earlier in 6th semester, I did an internship with the SS Welfare Organization, an NGO that works to develop new projects for implementation in countries where health conditions of people are not good. Projects of this NGO were mainly in Africa. During my final year project, I was the team lead of my project team and we did practical work of providing health facilities with the donation of CC Group of Companies. As part of project, we also included government officials with us and suggestions provided by our project team were so much appreciated that we had been issued a letter for applause from ministry of health. Furthermore, our suggestions are under consideration for implementation by the government department. As mentioned above, my experience, expertise and education make me a best suited candidate for this position. I would request a meeting at any time that you find appropriate so that we may discuss the requirements.